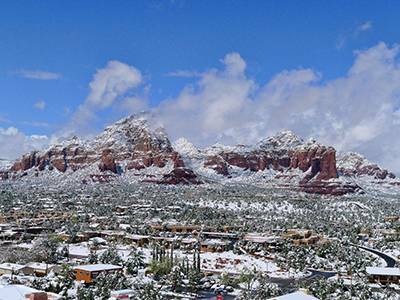 During the winter months, Sedona transforms into a dazzling wonderland, with light dustings of snow and millions of twinkling stars amidst the dark night sky. Sitting at 4,500-feet elevation, the town enjoys moderate winters. Mild temperatures during the day but there’s just enough of a nip in the air to enhance your hot cocoa come evening. Snow occasionally dusts the upper reaches of the surrounding mesas and mountains in a most picturesque fashion. Spend the day strolling the scenic streets of Sedona and enjoying mouthwatering restaurants along with several local wine-tasting rooms. The town nestled at the base of red sculpted cliffs is filled with an array of resorts, galleries and spas. Enticing aromas waft from restaurant kitchens and music fills every corner. Sedona’s shopping areas are woven into the fabric of the town, tucked away in nooks and crannies amid Spanish-style hamlets and elegant plazas. Roam the scenic streets where you’ll find one-of-a-kind gift items in galleries, boutiques and eclectic shops. World-class spas are prepared to wrap, scrub, soak, knead and soothe all your cares away. 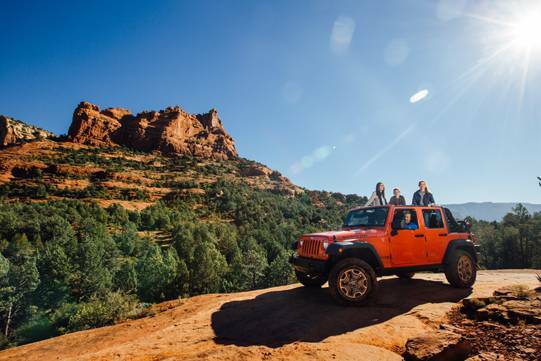 The range of recreational activities offered in Sedona make this the ultimate winter getaway for the family that plays together. Enjoy hot air balloon rides and helicopter excursions, thrilling jeep tours and horseback rides. Hiking and biking trails weave through the stunning outback. Kayakers paddle the Verde River all year round. There are wineries, museums and vortexes to visit. A wild animal park and excursion trains are just minutes away. There’s literally something for everyone. Choose your pleasure; choose your memories. Be sure to look at Sedona Special Offers here.